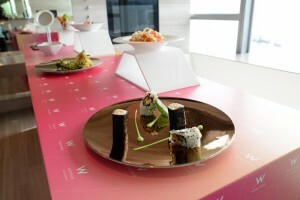 W Hong Kong today announced the exclusive launch of a new in-room dining concept menu curated by international yoga rebel and W Hotels’ FIT program partner Tara Stiles. Inspired by her global travels and active lifestyle, FIT Bites by Tara Stiles brings a light and fresh take to the W Hotels room service menu, specially designed for the jet-setting W traveler. Feeling Jet Lagged? Jump start to your next urban adventure with flavorful Creamed Pepper Noodles, a dish that is rich without being too heavy. Need a Boost? Kick start your day (or night!) with the tropicalParadise Island Toast. Each bite has a spicy kick that leaves you bursting with energy. Big Night Out? Get amped for a big night out with a snack that leaves you feeling light on your feet. Packed with vitamins, theAvocado Rolls are layered with nutrients for long lasting energy. Need to Recover? When feeling under the weather, the gooey and nutritious Banana Almond Butter Pancakes are practically a miracle cure. Stiles’ new in-room menu at W Hong Kong features natural and healthy ingredients to keep you FIT while jet setting the globe. For example, the Thai Papaya Salad includes an abundance of raw vegetables tossed with garlic, chili and lime juice, designed to minimize the effect of jet lag, a serious woe for avid traveler. Tara’s Never Get Sick Soup, blends hot sauce, coconut milk, ginger, curry powder, red pepper flakes together with nutritional yeast. To learn more follow @WHotels, @tarastiles and #posewhenever on Twitter and Instagram.